Chelsea have officially announced the completed transfer of Gonzalo Higuain on loan from Juventus. The Argentina international looks an exciting addition for the Blues, who have been in need of an upgrade on Alvaro Morata up front after his struggles at Stamford Bridge. 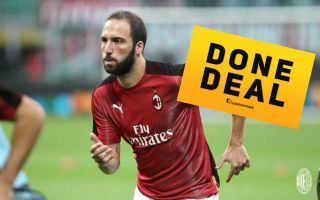 The club confirmed the signing of Higuain on their official Twitter account late on Wednesday night, news that will surely delight all of the club’s fans. Higuain has been one of the most prolific and consistent goal-scorers in Europe for a number of years, having particularly shone under Chelsea manager Maurizio Sarri during their time together at Napoli. While the 31-year-old doesn’t exactly join CFC now in the form of his life, fans will no doubt be excited about this big-name signing in a problem position to boost their hopes of clinching a top four spot in the second half of this season. Higuain’s arrival surely means the end for Morata at Stamford Bridge, with the Spain international also widely linked with a move this January for some time now. Goal’s Nizaar Kinsella is one of a number of sources to claim Atletico Madrid will be Morata’s next destination, though at the time of writing there is nothing official on that yet.